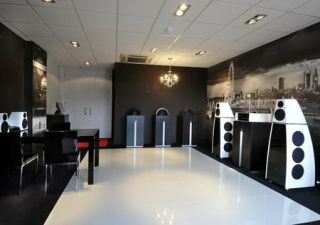 Meridian plans 40th anniversary showcase at Oxford store | What Hi-Fi? Meridian is continuing its series of 40th anniversary events with a showcase at the audio firm's Oxford store this Saturday, November 26th. The Oxford outlet (above) is Meridian's first dedicated European boutique store. On show this weekend will be Meridian's 40th Anniversary system, as well as the Sooloos Digital Media and DSP Theatre systems. What's more, the recently-launched compact Range Rover Evoque fitted with Meridian's surround sound system will be available for visitors to view outside the store. If you'd like to make an appointment to visit the shop, call Justin Rhodes at Meridian Oxford on 01865 782424 or email info@meridianoxford.co.uk.